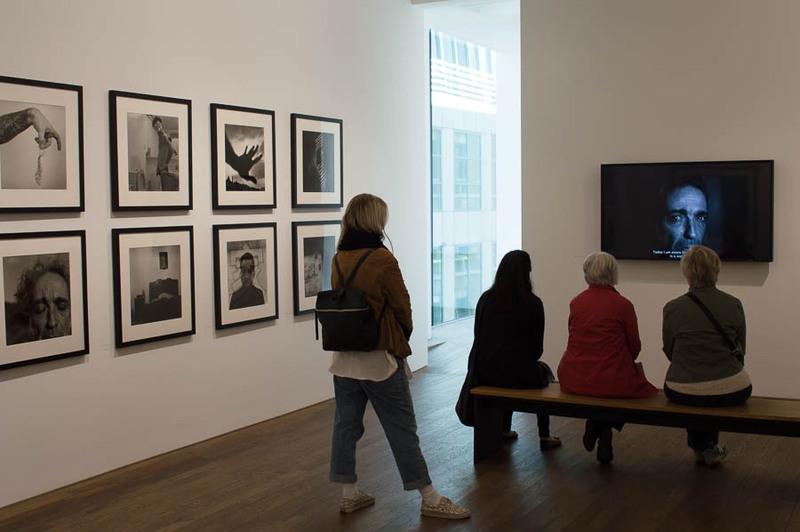 Every time I think I’ve just about grasped contemporary photography along comes another Deutsche Börse short-list exhibition at the Photographers’ Gallery (TPG), London, to shatter my illusion! This annual competition “…showcases new talents and highlights the best of international photography practice…” and “…aims to reward a contemporary photographer of any nationality, who has made the most significant contribution (exhibition or publication) to the medium of photography in Europe in the previous year”. And it’s worth £30,000 to the winner, so we should take it seriously! This year sees another disparate group of artist/photographers on the short-list. Even though they have photography in common, comparing them is like comparing apples to pears. Even having the criterion “the most significant contribution (exhibition or publication) to the medium of photography in Europe” doesn’t leave me envying the judges their job! 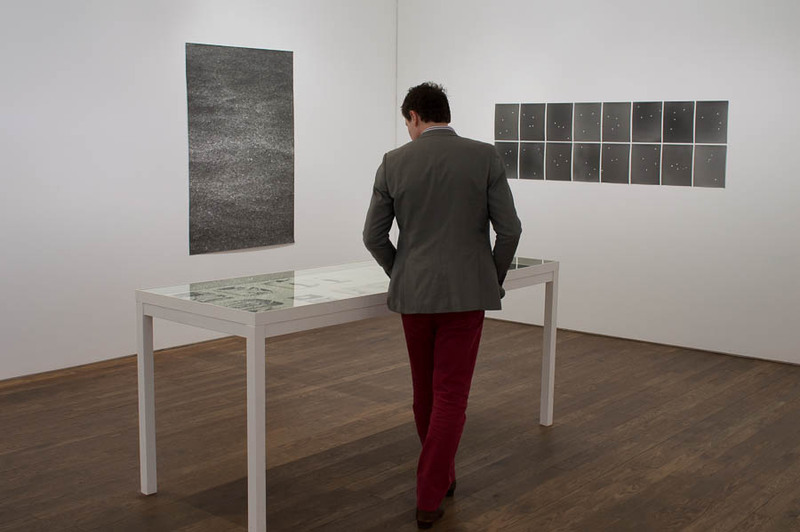 Another problem that we, the visitors to TPG exhibition, have is only seeing a fraction of each artist’s output. And how can we judge either their work or their contribution to the medium on this basis? Well I certainly can’t, so no judgement from me, only my opinions about the evidence as presented, m’ lud! On show were self-portraits of the artist progressing from youth to middle-age. Life has not been kind to Garcia-Alix: we see someone who has been saved from self-destruction by an ability for self-examination and self-criticism. Whether the camera is a vital aid, a helpful crutch or simply a recording device is not clear to me from the pictures. I find that there is altogether too much in this exhibition that is specifically about Garcia-Alix and not insightful to life more broadly. He seems to be stuck in the habit of introspection. I can see that this might appeal to those who are embroiled in the pervasive cult of personality but it holds no appeal for me. @shoespace tweeted that “self-obsession doesn’t make for winning photography”. It will be interesting to hear whether the judges agree. From other comments on social media, Garcia-Alix has polarised opinion more than any of the other artists on this short-list. There is a curious combination of scientific and artistic vision in this work that I found confusing at first: it’s not exactly a tension between the two aspects but more a dichotomy between two identities. Eventually I decided to downgrade the scientific in favour of the aesthetic. The flow and juxtaposition of the images is poetic in its execution and these brought new insights for me. For example, I was struck by the pictures of geese flying in vee formation with the patterns they formed looking like the profile of a human face. This alone is not something that would win the prize but I cannot remember seeing an exhibition that blended images of the natural world in such an unusual, pleasing, poetic way before, and for that reason could be judged to have made a contribution to photography, so I think it should be a strong contender for this year’s prize. 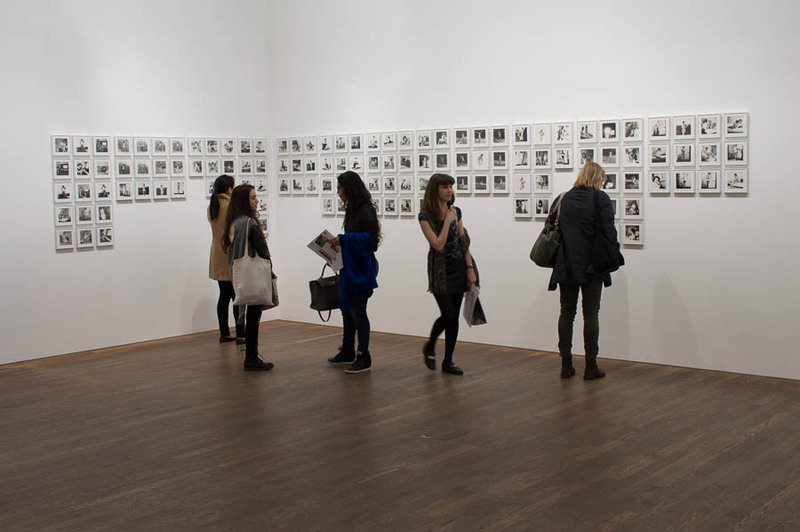 Mosse’s photos were originally shown as a collection titled The Enclave at the 2013 Venice Biennale Irish Pavilion. They were shot in the troubled Eastern Democratic Republic of Congo (DRC) and used an obsolete infra-red colour film to give a false colour rendition, which in a sense blends an artistic interpretation with a journalistic approach. 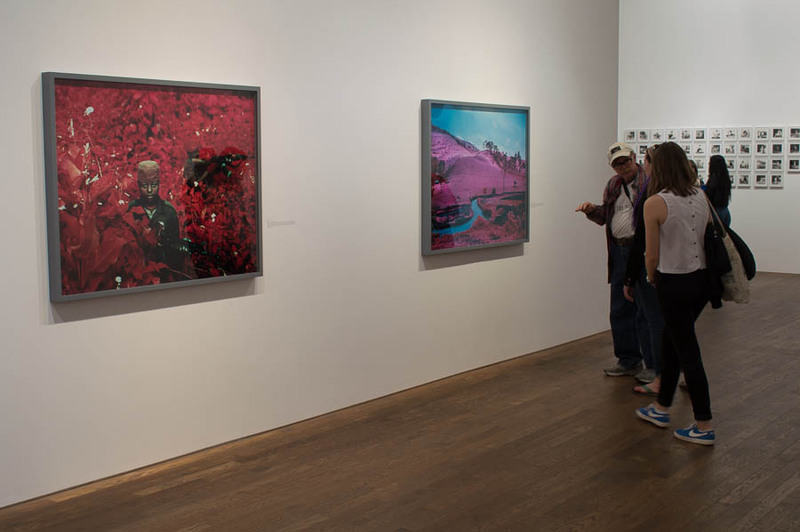 The images are a mixture of landscapes and environmental portraits of gun-toting soldiers. The pink/magenta foliage indicates a healthy flora and there is a lot of this in the images, but the men with guns show an environment infested with humans intent on killing each other: beauty and the beast! 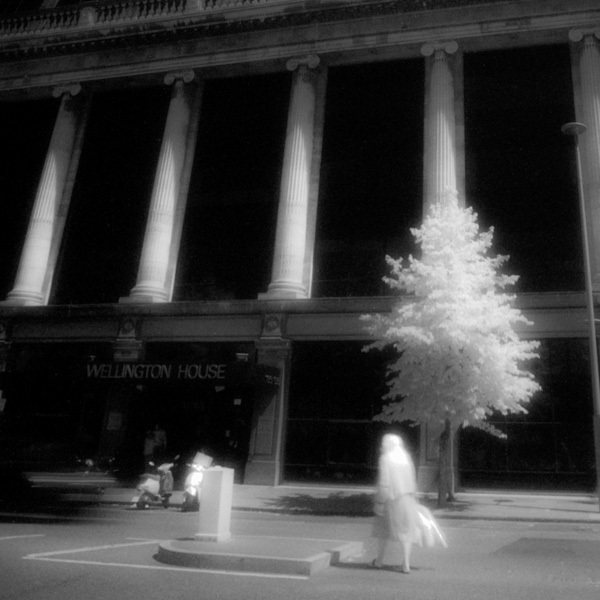 This juxtaposition has a dissonance made more extreme by the effective use of infra-red film. When I read about this in advance I was prepared for a visual gimmick but in reality I found it a surprisingly effective and innovative application of this old material, making Mosse a serious contender for the prize. Simpson has take a collection of images from the 1950’s showing women posing coyly for the camera, then photographed herself in similar costumes, lighting and poses. There are 128 identically-sized images only 5 of which show men, so immediately it is clear that there is a gender agenda as well as issues around culture and identity. This isn’t surprising since this is what Simpson is know for. This exhibit speaks softly to the viewer, quietly asking which images are from the 1950s and which from 2009? It is hard to tell the difference, and this is one of Simpson’s points I think: fashions might change but underneath do we as humans change? Simpson is black so placing herself with black women of the 1950’s is a good pairing, but racial segregation in the USA was only made illegal in 1954 so the women in these photographs will have had to use black-only facilities. It takes a society many years to adjust to this type of cultural change and Simpson seems to be asking us to look inside and ask to what extent are we different now? Only the viewer can answer. 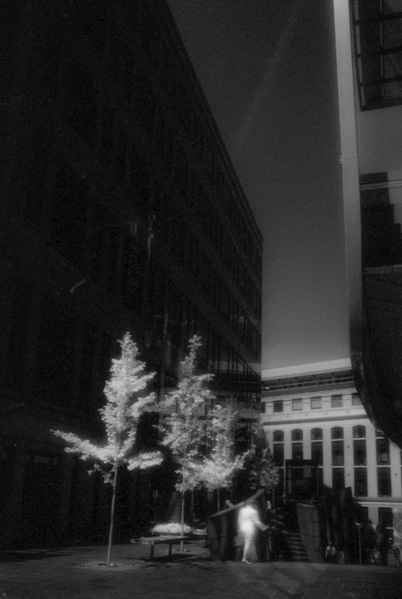 Although Simpson is American, the questions she poses are universal and so puts her in the frame for this prize, especially when taken in the context of her wider body of work.